Falkirk were defeated in their fourth pre-season friendly on Monday, falling 1-0 to Highland League side Cove Rangers. Jonathan Smith’s 88th minute header gave last season’s Highland League champions a narrow victory at Montrose’s Links Park. It was a game of few chances, but a major talking point early in the game. Ruben Sammut played Dennon Lewis through on goal, only for the striker to be taken out whilst baring down on goal. The referee refused to show the Cove defender a card for what would likely have been a red card in a competitive fixture. Deimantas Petravicius’ free-kick didn’t deal any justice either as it was struck tamely into the wall and then scrambled clear by Cove. Cove physicality was evident, and the Aberdeenshire side caused the Bairns plenty of problems from corners and in the air. Leo Fasan, starting in goals, had to react quickly to thwart former Aberdeen striker Mitch Megginson shortly before the break. Jordan McGhee had Paul Hartley’s side’s last chance of the first period. The Bairns won a free-kick in a similar position to the one Petravicius struck into the wall, this time the Lithuanian stepped aside and McGhee planted his effort into keeper Stuart McKenzie’s hands. 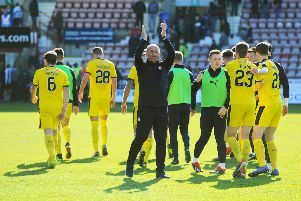 Into the second period and again the changes were aplenty for Falkirk. Six players were replaced at the break with two trialists included in the six entering the field of play. Kevin O’Hara, subbed on with 25 minutes left to play, had the best chance of the second period for the Bairns. He fired just wide from inside the area. And Cove won the match with just two minutes left to play. A cross from the right hand side of the pitch was clipped in perfectly for Jonathan Smith to flick into the far corner. Paul Hartley’s side are back in competitive action when they play Montrose at The Falkirk Stadium on Saturday afternoon. Mo’ boss Stewart Petrie was at Links Park to watch the Bairns in action on Monday, but insists his side are treating the League Cup as an extended pre-season.